I’m a bit jealous of those of you who have Autumn weather already appearing in your areas. I guess you could say that Las Vegas is cooling down a bit, but today’s high was still at least 95 degrees F. Well, at least the nights feel like they are getting cooler. While it doesn’t feel very Fall-ish in these parts, there is things I do that (somewhat) satisfy my love of the season. One thing I do is go all out with my Autumn decorating. I think I decorate almost as much for Autumn (and Halloween and Thanksgiving), as I do for Christmas. The other thing I do is start cooking meals and desserts the celebrate the flavors of Fall. This week, I am participating in #SundaySupper and our theme for this week is Autumn Apple Party, hosted by Cindy of Cindy’s Recipes and Writings. Apples are the number #2 food I think of when I think of Autumn (the first one is pumpkin), so I was particularly eager to get cooking! 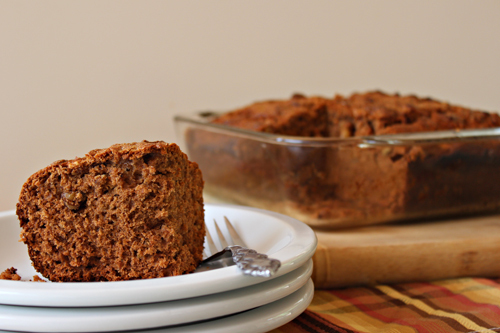 The recipe I’m contributing to the Autumn Apple Party is Apple Butter Spice Cake. 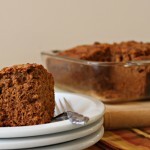 It’s an apple cake full of flavor, plus it is made in one bowl, so there is less to clean up. It’s great with some whipped cream, or a scoop of vanilla ice cream…although we had it just by itself, which is also good. If you are in the mood for some Autumn cooking, like I am, you’ll definitely want to check the list at the end of this post — it’s full of over 60 different Autumn Apple recipes! Preheat oven to 350 degrees F. Spray an 8″ square pan with nonstick cooking spray. 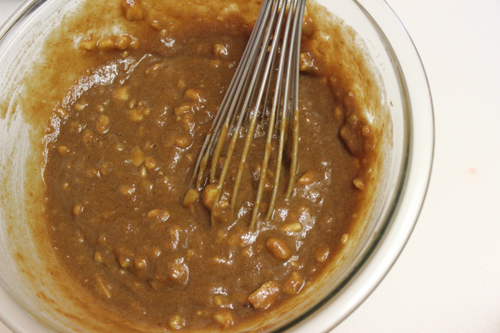 In a large bowl, place melted butter, apple butter, brown sugar, and oil and whisk until smooth. Add apples, nuts, buttermilk, egg, and vanilla and mix well. Add flour, baking soda, cinnamon, ginger, allspice, and salt; whisk until just combined. 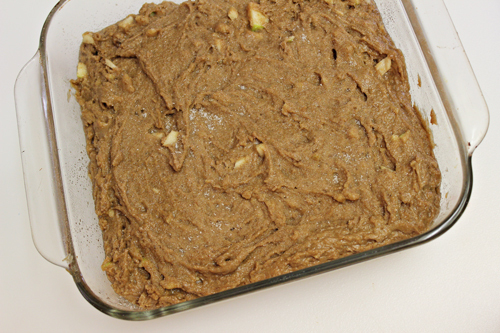 Spread batter in the prepared baking dish. If desired, sprinkle top of batter with a bit of granulated sugar. Bake until a knife inserted in the center comes out clean, which will be about 35-40 minutes. I just canned 4 pints of apple butter and this looks like a great way to use it up! Your cake looks so good! This recipe is getting pinned. uhhh I’ll take whipped cream and a couple scoops of ice cream with the whole cake thank you. I’m a glutton. Cake looks so delicous! 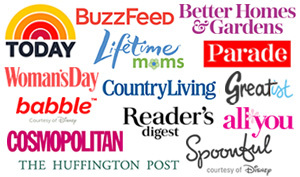 Mmmm… I don’t know what I love best. Apple Pie or Apple Cakes. It is so hard to choose, and this cake looks great! This looks amazing! I may do a riff on it with my peach butter too! Brandie, your cake looks so good. Never try butter cake with apple, I shall try this recipe soon. Thanks sharing! This is a great snack cake Brandie! I have Apple Butter that I made so I can use it for this cake! I have never had apple butter before, it is on my list of things to make. This cake sounds absolutely delicious! This looks like a great afternoon snacking cake, or for breakfast, dessert, midnight!!! Sounds yummy and looks delicious! Thanks Brandie. I love these type of simple desserts. Brandie this looks fantastic. Love apple cake, and this flavour combination is amazing. oh, I love that you used ginger in this! I love ginger! I love decorating for fall 🙂 – Your cake looks delicious! This sounds so delicious! Thank you for sharing! I imagine this would also be fabulous as a breakfast treat, too! I’m all about enjoying the sweets in the morning, too! I love, love, love apple butter! This cake looks delicious and screams fall! Happy #SS. This sounds like a great cake. I love the idea of decorating for fall, but I almost always run out of time. Maybe this year? Brandie, this looks SO fab! I love spice cakes! I am like you…here in So Cal it is still pretty dang hot, so sometimes fall flavors are the best way to get in the mood for the new season. I so admire people who decorate for the seasons. My mom has that gene, but she didn’t pass it along. This makes it okay to eat cake for breakfast. The spices are perfect with coffee. And, well, it would be great for a snack anytime too. 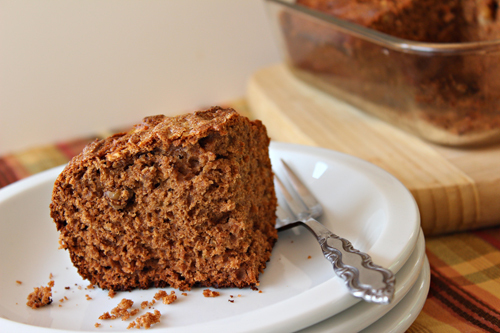 I never made apple butter, but this is my kind of `plain´ cake, full of spices! Wonderful recipe Brandie! Have a great sunday! Just the perfect cake to announce fall! Love the recipe and can’t wait to try it.